3 reds, including a lively Nebbiolo grape from Valtellina, a Montepulciano from the small Molise region, and a big Tuscan from Bolgheri. For the white drinkers, we will offer a Pinot Grigio from Veneto! The D.O.C. name covering most of Valtellina area including the less steep and rocky areas of Retica banks. This red wine has a fruitier bouquet and is lighter than Valtellina Superiore. It can be drunk after only one year, is fresh and lively and a typical wine to suit all meals. 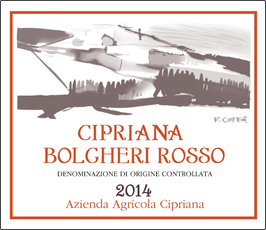 The wine is ruby red, with a delicate vinous body, feminine fresh, harmonious and lively. Great match as an Aperitivo or light fares and white meats. 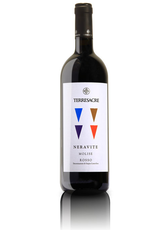 Neravite comes from a careful selection of Montepulciano grapes grown in the Terresacre farm, 100% hand harvested on the third ten days of Octobert, picked up into large cases of 20 qt. capacity. Softly crushed, to respect the grapes integrity. The destemming phase follows and then the vinification where maceration occurs in small steel fermentation tanks, for at least [5 V 20 days, with continuous daily stirring . The fermentation at controlled temperature is kept at 28° C. The result is a wine with Intense ruby red color. Elegant aromas at nose, with a scent of black cherry and blackberry jam. Dry, warm, persistent taste, with soil tannins. Recommended with: red meats, important first courses, wildfowl, typical Molise cheeses and cold cuts. The Cipriana estate is located in Castegneto Carducci, Viale dei Cipressi (the Cypress Walk), is where the poet Giòsue Carducci found inspiration, near Suvereto in Bolgheri Tuscany. On one side there is the famous row of Bolgheri cypress trees, the aromatic vineyards and the mediaeval towns of Campiglia Marittima, Massa Marittima and Sassetta, and on the other side, there is the coastline of fine sandy beaches, the Etruscan remains in the archaeological site of Populonia and the unique necropolis on the sea in the Gulf of Baratti.The Fabiani Brothers vinery has been producing great wines since 1975 with 8 hectares of vineyard and 3 of olive trees. The wines produced are: two Rosso Bolgheri, one Bolgheri Superiore, one Vermentino Bolgheri and one Bolgheri Rosato.The company cellar is entirely underground in order to guarantee the best temperature for vinification and ageing in the cement barrels, which are kept at a controlled temperature. Exclusively using property grapes.The original consultants were oenologist Dott. Alberto Antonini and the agronomist Dott. Francesco Venerini. Now is proudly runed by Tiziano Vistalli. This Bordeaux blend of Cabernet Sauvignon and Merlot is hand harvested in small boxes and is vinified in cement vats at temperature controlled where the malolactic fermentation is carried out. Is then fined In barrique for 6 months. The wine is bright ruby red in color, with a delicate perfume of black berry little fruits, bilberry and prunes jam. With a smooth and warm taste, it has a refined structure and a lovely fruity finish. It results in a versatile wine, suitable for first courses with meats and venison’s juice, for roast meats and mixed grills of game too, for medium mature cheeses. Also try with a spiced fish soup (Cacciucco). Only 6,000 btls made. Castello di Roncade between Treviso and Venice is an exceptional example of large production managing execptional quality thanks to the old system of renting many parcels of their land to local farmer allowing more control over the quality of the grapes. Certainly helped by the fact that their winemaker is talented Umberto Trombelli (winemaker of the year 2018). This particular varietal is finified in stainless steel . Straw yellow with greenish tinges, nose. Fruity aromas , intense, fresh, palate pleasantly fresh, slightly acid, pair with fish dishes. Previous Post January 11, 2019 – Italy Vs USA Wine Tasting! Next Post January 25, 2019 – Spanish and French Wine Tasting!